Read here about tensegrity structures composed of two struts, part of a series of pages organized by strut count. 1.2 Is x-module one central x unit, or two perpendicular, intersecting struts? A 2 strut tensegrity is not really a true tensegrity as it lies flat, the struts touch, and it does not enclose space. Snelson calls 2 struts the "kite frame," after the traditional two-strut frame that stretches the skin of an air flying kite. As Snelson explains, this 3 strut is not yet stable. Two more filaments are are needed to anchor the new, perpendicular strut to the farthest ends of the original 2 struts. Is x-module one central x unit, or two perpendicular, intersecting struts? 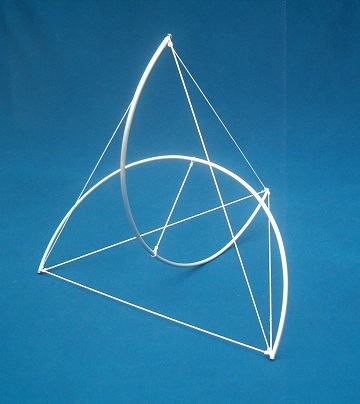 Connelly cites Snelson's X Tensegrity as the simplest tensegrity. The X in the center can be considered as two perpendicular, intersecting struts. The X can also be considered as a flat form of a central, nucleated compression structure. In nature, such a nucleus would spread the top to radiating struts in the perpendicular plane, thus each of the four radiating struts outlining the vertices of a tetrahedron. This is the nucleated form that Levin and Flemons use to model the human spine. [Pars, Marcelo|Pars]] suggests that this "2-strut" tensegrity is probably the most simple tensegrity ever. For the record one should add that the tendons between the two ends of the same half circle can be removed, implying that the tensegrity has only 2 struts and 5 tendons. This page was last edited on 23 September 2018, at 12:23.